The new Citywide Ferry service will launch June 2017. BROOKLYN NAVY YARD — When the Citywide Ferry service launches in the summer of 2017, seafaring commuters won’t be able to transfer for free to the city’s bus or subway systems, but five New Yorkers will at least be able to claim dibs now on a free annual ferry pass. Potential riders can enter to win by filling out a survey on the Citywide Ferry’s newly launched website. Winners will be announced sometime before the ferry service’s launch, which is scheduled for June 2017. The new website will feature project updates, dates for public meetings, a live stream of boat construction, maps and schedules and postings for the more than 150 jobs that Citywide Ferry is expected to create. The Citywide Ferry will be based at the Brooklyn Navy Yard. The mayor’s office announced last month that the ferry service, operated by San Francisco-based Hornblower, would launch next year. It will cost the same as a MetroCard ride, currently $2.75, and run an estimated 4.6 million trips a year when it's fully operational in 2018, the city has said. Passengers will be able to bring a bike for an extra $1 or buy a monthly unlimited bike pass for $20, according to the website. Free transfers will be allowed to other Citywide Ferry boats. Approximately 12 ferries would be in operation in its first year on the Astoria, South Brooklyn and Rockaway routes, with the remaining six boats up and running on the Soundview and Lower East Side routes running by 2018. The ferry will shuttle passengers from neighborhoods including Bay Ridge, Sunset Park, Red Hook, Astoria, Roosevelt Island and Long Island City to Manhattan. While Mayor Bill de Blasio wants the ferries to offer a free transfer to MTA subways and buses, a spokesman with the Economic Development Corporation said the possibility for free transfers is still a ways away. “That is still a longer term goal for the city for the ferry to be integrated with the city’s larger transit system,” Anthony Hogrebe, a spokesman for the city’s Economic Development Corporation, said Thursday. Hogrebe said free transfers would currently be difficult to arrange since the MTA plans to phase out the MetroCard by 2020. “Until they determine what the new media is, it’s going to be hard to integrate because the last thing anybody’s going to do is invest in infrastructure that’s going to be obsolete over time,” he said. 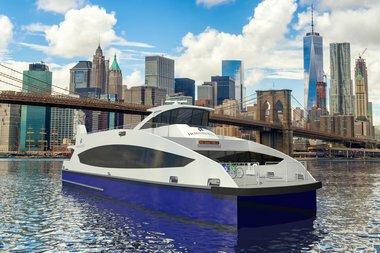 Hogrebe emphasized there will be free transfers between the ferry system’s six routes, including the existing East River Ferry routes. Another of the mayor's signature transportation projects, the proposed $2.5 billion Brooklyn-Queens streetcar, also currently will not include free transfers to MTA buses and subways.